Energy Estimator for Nitrogen is the second of several tools from Natural Resources Conservation Service (NRCS) developed to increase energy awareness in agriculture. This NRCS energy consumption tool enables you to calculate the potential cost savings of nitrogen product use on your farm or ranch. NRCS agronomists have developed these cost estimates based on nitrogen fertilizer management methods for the predominant crops in your state. This tool does not provide field-specific recommendations. It evaluates options based on user input. Read this important Use and Interpretation information. 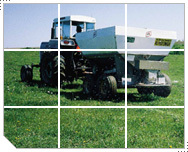 Select the Fertilizer Materials available in your area. Select the Fertilizer Unit of Measure for price. Only check fertilizers available in your area.